With the success of Come Home Love <愛．回家>, TVB will be extending the sitcom to 700 episodes. Leading man, Lai Lok Yi (黎諾懿), received a boost in popularity and income. Last year, Lok Yi also invested a seven-figure sum in a car repair shop with his two brothers. 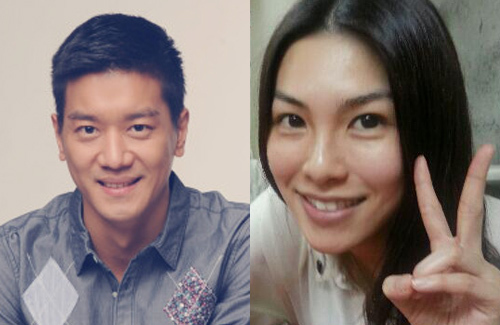 With a stable career, Lok Yi is ready to marry his girlfriend of four years, Nicole Lee (李潔瑩), this year. A participant in the 2007 Miss Hong Kong pageant, Nicole dabbled in an entertainment career before returning to help manage her family’s beauty corporation. Nicole is currently the General Manager of the family’s $100 million HKD beauty business, which includes five “Dr. Renew” skincare clinics, as well as sixteen other beauty centers. Nicole maintained good relationships with former pageant friends and it was through Loretta Chow (周美欣) that she met Lok Yi. Although Nicole is used to a life of luxury, Lok Yi denies that he has pressure with the upcoming wedding plans. Lok Yi simply said that Nicole has a rather large family so he is hoping to earn more money from Come Home Love to help with the wedding expenses. The two were spotted shopping at a home decor store in Causeway Bay, perhaps preparing for their new home together. Congratulations, Lai Lok Yi. You have found a better partner even though you got dumped by your ex-girlfriend. This one is more fruitful for you. Was it Tavia Yeung who left Lai Lok Yi for Him? I think so. I just know that Lai Lok Yi had been “chasing” Tavia Yeung for years before she got Him Law. congratulations lai lok yi and his girlfriend！！！！！oh yeah i still remembered that lai lok yi was chasing tavia a few years ago and after she got him law i still remembered it!!!!!!!!!!! Wow 700 eps?!? Is this 100% confirmed?? Marry his gf of FOUR YEARS??! Didn’t they only got together around 2012 @@??!! Dislike this guy. His character is obnoxious in ‘Come home Love’. If indeed he had chased Tavia before, I say Tavia did the right thing by not responding to his advances. I thought they actually dated?! Your funny, you explain nothing about his personality and why tavia made the right choice. How much better is him law? >>>Dislike this guy. His character is obnoxious in ‘Come home Love’. Come Home Love is one of the few series that gets a lot of good feedback so I can see why they want to extend the series. I just want them to have John and Alex get together already! I hope everything goes well..
What they expanded that series? Oh gosh wasn’t it already long enough? I wonder if they will bring it up to 100 eps? Meant to say 1000 eps. Lai Lok Yi has improved a lot in his acting and speaking dialogues in the last 2 years. I can see his improvements in “Come Home Love”. He has been able to get rid of his lazy intonations, which is very important in speaking dialogues. happy for you Lai Lok yi! He looks better in this pic. I love come home soon, ” ah jong” is a great guy, wishing him all the best! wow – how old is that guy? is he young enough to be Chun Bok Keung’s secret son? ?